There were no surprises when Sebastian Vettel, took pole position during qualifying for the Formula 1 Grand Prix in Singapore. Vettel lost the lead at the first corner to Rosberg but regained it as the Mercedes driver ran wide at turn two. A safety car period chipped away at his 12-second lead, but at the end of the race, it was all Vettel. Red Bull driver Sebastian Vettel took no one by surprise when he recorded another win at the Singapore Grand Prix on Sunday. Once again extending his lead in the Formula One championship. Winning by a sizeable 32.6 seconds over second place Fernando Alonso, to increase his championship lead from 53 points to 60. Vettel said, "I am just enjoying the moment.” He continued by saying, “Days like today and yesterday are what it is all about." 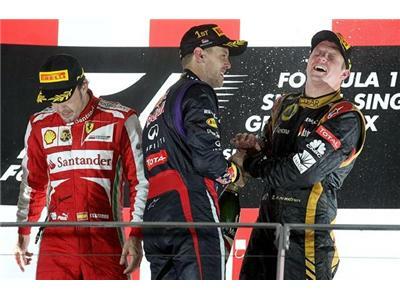 Lotus driver Kimi Raikkonen was third, slightly ahead of the Mercedes team Nico Rosberg and Lewis Hamilton in fourth and fifth respectively.